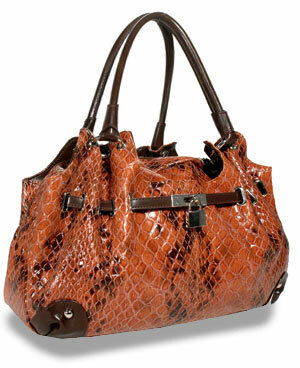 Ladies enjoy carrying this Large Snakeskin Texture Tote Handbag. Just a few bags invoke the words “Urban Chic” like this gorgeous snakeskin tote bag. This bag is made of the finest quality synthetic leather which is patterned to look like natural snakeskin for a classic yet edgy look. The caramel and brown colors blend so very well throughout the entire handbag. This bag is cut into three sections by a zippered divider that adds more storage to the other pockets. The front pocket also has a belted detail with a small lock and key hardware, which gives this bag a unique look. This stylish snakeskin tote can be paired with jeans or fancier dress attire. For just $60.00 this handbag can be worn by a true Fashionista, like you…. Which are the most popular designer bags?